SAN JOSÉ, CA— The book of “JERSEY BOYS” is based on a true story. It was written by Academy-Award winner MARSHALL BRICKMAN and RICK ELICE, who poured into its pages segments of the lives of four young singers during the 50’s who called their group, THE FOUR SEASONS. In its return to San José, “JERSEY BOYS” a Broadway San José, Nederlander Presentation, allows us to hear again the music of BOB GAUDIO and the lyrics of BOB CREWE, interpreted in the marvelous voices of four actors: TOMMASO ANTICO representing Bob Gaudio, COREY GREENAN representing Tommy De Vito, CHRIS STEVENS representing Nick Massi, and BEN BOGEN who in his role as Frankie Valli, gave the audience a wonderful imitation of the “falsetto” (In the voice of the original singer) who was responsible for the “uniqueness” in the "sound" which gave fame to THE FOUR SEASONS. 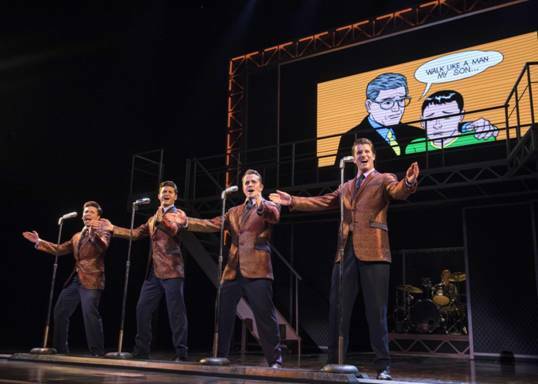 “JERSEY BOYS” is a story, of love, joy, tears, fame, jealousy, and even troubles with the law, but what makes this musical “unique” and endeared to the audiences, is that at its core is Honor. A biding promise among two men, (Valli and Gaudio) that even when it never was written, was kept by both of them, because it had been “sealed” with the hand shake of a "Jersey's man". The story in “JERSEY BOYS” begins in 1951 in Belleville, New Jersey, a working class town on the outskirts of Newark. Our characters are four Italian kids, High School dropouts, which could be described as “Juvenile Delinquents” because, with the exception of Castelluccio, Frankie’s real last name, who was only 16, the rest of them had been in trouble with the Law. The thing that these youngster had in common, however, was that because they loved to sing, they sang in the streets and dreamed to become professional singers. But this did not happen until 1959, when another Italian kid by the name of JOE PESCI introduced Tommy, Nick and Frankie, to BOB GAUDIO, from the Bronxs, a musical genious who had adapted his classical piano lessons to write “Short Shorts,” for the group "The Royal Teens" at the age of 15. Because of it, he had gained some fame. After forming a group with Gaudio, the group became “THE FOUR SEASONS" When they were ready to record their music they went to BOB CREWE, (WADE DOOLEY) a record producer, who for years used GAUDIO to write music for his lyrics and the boys in the group as backup singers for his other singers. In l962, with Gaudio song “Sherry” as a hit, and an invitation to peform inAmerican Bandstand, the “FOUR SEASONS” was “born.” After that, GAUDIO and CREWE began creating hits: “Big Girls don’t Cry.” Bye, Bye Baby” “Can’t Take My Eyes off You” and “Walk like a Man” to name a few, THE FOUR SEASONS were on their way to fame. But as the four singers climbed to fame, their private lives began falling apart. We learn how in the the musical, by paying close attention to the songs' lyrics which tells us their story. And as we observe what is happening, we learn to admire two men: Gaudio and Frankie who kept on going fulfilling their promise. Gaudio's motivation may have been selfish in part. He wanted to hear his music sang by Valli. Frankie's motivation, however, was gratitute. He could not let down the man who, when he was a boy with no future, had believed in him, and even helped him to become a singer. We could could add, that the show moves smoothly. Everything went perfect on opening night. It was so good, that many songs were followed by applause. The orchestra was tuned. The music played on time, and each one of the male and female actors gave the audience an star-performance. The show ended with a long standing ovation. While many actors need to be mentioned, we will mention one, for his acting, and singing. BEN BOGEN (The standby for principal JONNY WEXLER) who played his role as Valli, masterfully. He acted his character in "character" and represented his emotions well. And when singing in the Valli's style, BOGEN produced a pleasant "falsetto" which imitated well the original "falsetto" that made the audience of the sixties love the “sound” of THE FOUR SEASONS. 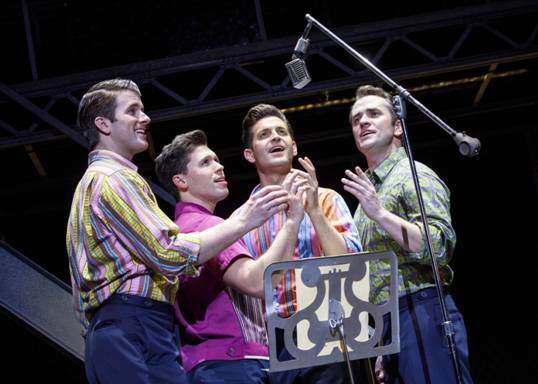 JERSEY BOYS is an Award-winning musical which won the TONY AWARD® in Broadway for “Best Musical in 2006. A Grammy Award for Best Musical Show Album in 2009 and The Olivier Award for Best Musical in London, and the Helpmann Award for best musical in Australia in 2010. However, for those of us who remember the original, we could say that it has been improved during the years. 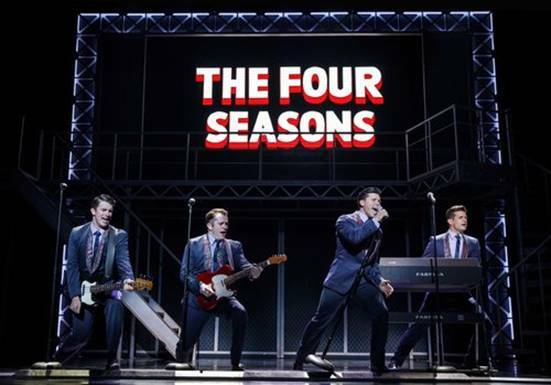 JERSEY BOYS will be shown at THE SAN JOSE CENTER FOR THE PERFORMING ARTS, 255 S Almaden Blvd. in S.J. until June 10. For tickets you can go online to www.broadwaysanjose.com or order by phone by calling: (800) 982-2787.